When it comes to breaking the vicious cycle of hunger and poverty that plagues one in nine people worldwide, there are a few key reasons cash transfers have proven one of the most effective methods. Getting food to those who need it most often means more than sending a ready meal in a box. The challenge is getting them access to food as soon as possible. Thank goodness for cash. By definition, time is of the essence during any crisis. 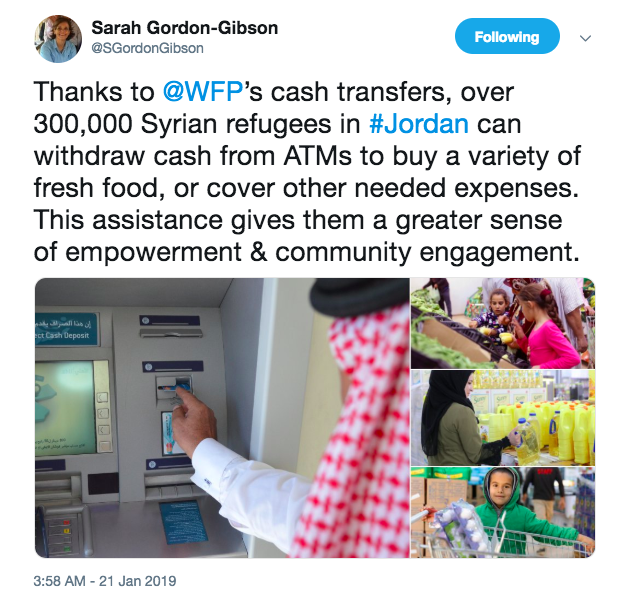 It is no wonder that one leading NGO, the World Food Programme, switched from food aid to cash aid while responding to the Syrian refugee crisis in Lebanon. Transporting cash is logistically more cost-efficient than edible products with a limited shelf-life and temperature demands. As long as those who need it are somewhere near a food market, cash is the best way to ensure they have food when they need it. Furthermore, because cash means choice, less food goes to waste when the people consuming it are able to decide for themselves when and what they'd like to eat. When displaced people are forced to flee a state of emergency and adapt to a stable society where they are an outsider, being able to use cash becomes a valuable social equaliser. Paying for goods with refugee-vouchers mean that for every financial decision, a refugee is reminded that they are different to the rest of the customers in the market, whereas with cash, they are granted the dignity of paying like everybody else. Cash transfers are known to have a multiplier effect on the local economy. By enabling people to purchase essential goods locally, they can help strengthen local markets, encourage small-holder farmers to be more productive and build national capacities. Studies conducted in Lebanon, Rwanda and Uganda have shown that US$1 given to a refugee translates into almost US$2 into the local economy, as businesses respond to the increase in demand. Cash transfers can also be integrated into broader social protection and safety net systems. In particular, in countries where there are no social protection systems – or where these are weak, rolling out WFP cash transfer programmes can help support their creation and strengthening. In Ecuador, WFP’s emergency cash programme in response to the 2016 earthquake was instrumental in strengthening the national safety net system.